It can be pretty noisy in a beehive. Just listen carefully. Acoustical signals have been found to be used for communication among honey bees in a number of behavioral contexts (Kirchner 1993). Bees coordinate their social behavior through an impressive array of specialized signals (piping, tooting and quacking) many of which incorporate air- or substrate-borne vibrations generated by the wing muscles (Pratt et al. 1996). 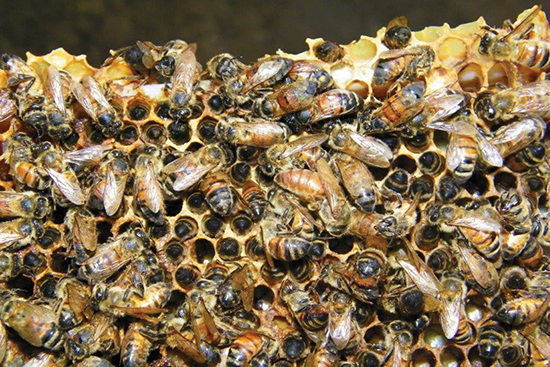 Queen piping are acoustic signals emitted by young queens during the process of swarming. The piping emitted by emerged virgin queens is called “tooting.” The tooting signal starts with one or two pulses of about one second duration with an initial rise in both amplitude and frequency. These first long pulses are followed by a variable number of short pulses of about 0.25 second duration (Michelsen et al. 1986; Kirchner 1993). The fundamental frequency rises from around 400 Hz on the day of emergence to more than 500 Hz two to four days after emergence, whereas the number of pulses decreases from about 17 to about seven pulses per performance during the same period of time. Following the issuance of the primary swarm, a surplus of queens are raised by the workers, the queen that first emerges from her cell announces her presence by tooting and also by release of pheromones (Winston 1987). Mature queens still confined within their queen cells answer the tooting with a distinct piping sound, the so-called “quacking.” When several confined queens are present in the nest, a chorus of synchronized quacking follows each tooting (Wenner 1962; Michelsen et al. 1986). The structure of the quacking has been described as a sequence of short pulses typically less than 0.2 seconds long (Kirchner 1993). The fundamental frequency of quacking is approximately 350 Hz and thus lower than that of the tooting. Queen piping (tooting and quacking) is broadcast in the bee nest as vibrations of the combs (Michelsen et al. 1986). Queens breathed continuously while they were piping, and were able to pipe with all spiracles except one blocked, so the sound could not have been produced by air entering or leaving the spiracles. It is produced by operating the flight motor without spreading the wings, and is radiated partly by the substratum, to which the vibrations are communicated by pressing the thorax against it (Simpson 1964). Toots and quacks last several seconds and are broken up into syllables (Michelsen et al. 1986) whereas worker pipes last no more than one second and consist of a single pulse of sound. Queens pipe only in the context of colony reproduction, while workers pipe in a variety of circumstances, including foraging and colony defense in both queenless and queenright colonies (Pratt et al. 1996). In honey bees the simultaneous presence of several emerged virgin queens in the period preceding afterswarming, is prevented by a delay of emergence of all queens but one. It this way fighting between queens is avoided. Grooters (1987) studied the processes responsible for this delay. The significance of the tooting sounds produced by the emerged virgin queen was examined. Queens ready to emerged cut the cap of their cells. In isolated queens this activity was interrupted by replay of recorded tooting. Consequently their emergence was delayed for several hours. 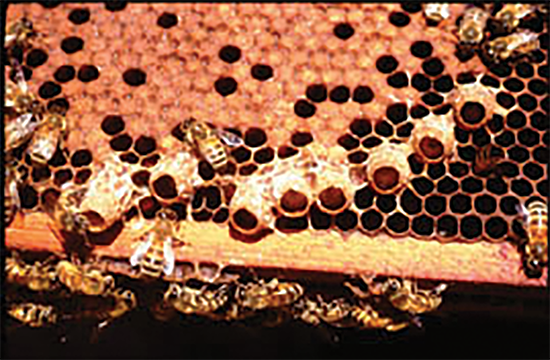 If, however, queen cells in observation hives were exposed to tooting, the emergence of queens was much more delayed, because in this situation worker bees confine the queens in their cells. The confining effect of vibratory dances, a worker behavior often observed on cells with queens ready to emerge, was explored, but could not be demonstrated. An important element of worker behavior effectuating confinement appeared to be the sealing of cuts made by the enclosed queens in their cell caps. Incisions in queen cells were closed at the same rate before and after a 24 hour period of transmission of tooting, so sealing is not influenced by the presence of tooting. It is argued that separately tooting and sealing by workers cannot cause a long term delay of emergence of queens. Their combined presence is essential: tooting inhibits the activity of queens sufficiently to enable the workers to obstruct their emergence for days (Grooters 1987). Cells containing developing honey bee queens, were subjected to two types of substrate vibration about one day before the queens were to emerge. A continuous vibration of 600 Hz caused a delay in emergence, but the vibration from queen-bee piping did not. The mortality of the developing queens exposed to either type of vibration appeared to be greater than normal (Spangler 1971). 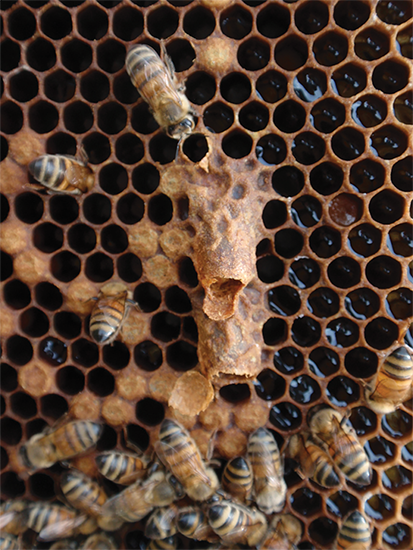 Queen piping vibrations are transmitted through the comb and perceived by vibration detectors in the workers’ tarsi. An emerged queen announces her presence by pheromones and piping- a series of pulsed, high-pitched sounds produced by a queen pressing her thorax and operating her wing-beating mechanism without spreading her wings (Simpson and Cherry 1969). Prior to going on a mating flight, a queen pipes frequently, perhaps to protect herself from the workers rough handling, since the workers near the queen freeze while she is piping (Winston 1987). Mated queens sometimes pipe before swarming (Allen 1956), but the frequency of piping is greatest between the time the first virgin queen emerges and the end of afterswarming, when the remaining queens fight. The behavior of young honey bee queens and of worker bees was studied in an observation hive. Tooting and quacking signals emitted by the queens were recorded as airborne sound and as substrate vibrations of the combs by means of a microphone and a laser vibrometer, respectively. The fundamental frequency component is larger than the harmonics when the signals are measured as vibration velocity, and it is argued that the signals are carried mainly by the frequency component. The frequencies emitted depend on the queen’s age and the tooting syllables contain a frequency sweep. These observations may explain some of the very diverse frequency values reported in the literature. The fundamental carrier frequencies of the toots and quacks overlap, but the tooting syllables have longer rise times than the quacking syllables. Recordings of the vibration of cells in which queens were confined allowed them to measure the threshold for the release of quacking in the confined queens by artificial toots and by natural toots from emerged queens. Artificial toots with long syllable rise time are more efficient in releasing quacking responses than are toots with short syllable rise time. This observation may suggest that the bees recognize these signals mainly by their temporal structure. A comparison of the threshold, emission level, and attenuation with distance, suggests that these and other vibration signals are used by honey bees only for local communication within a restricted area of comb (Michelson et al. 1986). Experiments were carried out to examine the role of chemical and acoustical stimuli in the detection of fully matured queens just prior to emergence by virgin honey bee queens (Harano and Obara 2004). When the empty queen cells, which had previously housed either nine-day-old broods or adult queens just before emergence, were presented in pairs to virgin queens in the experimental cages, the virgin queens preferentially destroyed the queen cells that had housed emerging queens. They also found that virgin queens tended to destroy queen cells housing emerging queens that were allowed to move freely inside the cells much earlier than queen cells with movement-restricted emerging queens. These results suggest that both olfactory stimuli derived from the queen broods and acoustical stimuli caused by the movement of emerging queens are factors that virgin queens use to distinguish queen cells containing fully matured queens from those with younger ones. Worker piping, previously reported only in association with colony disturbance or queenlessness, was seen in undisturbed, queenright colonies. Workers piped by pressing the thorax to the comb, spreading the wings slightly and lifting the abdomen towards the wings, which vibrated noticeably as the bee emitted an audible wail. Pipers wandered throughout the hive for up to 2.5 hours, stopping every few seconds to emit a pipe, which lasted about one second. The sound showed little frequency modulation, and a fundamental frequency of 330-430 Hz. It appeared to be produced by wing muscle vibrations and to be loaded into the comb by pressing down the thorax. Of three workers whose experiences prior to piping were known, two had been foraging and one had been unloading water collectors. Piping in this context may serve as a foraging-related signal, although its receivers and the information it transmits remain unknown (Pratt et al. 1996). Worker piping, previously reported only in hives, was observed in swarms as they prepared to liftoff to fly to a new home. Pipers are excited bees which scramble through the swarm cluster, pausing every second or so to emit a pipe. Each pipe consists of a sound pulse which lasts 0.82±0.43 seconds and rises in fundamental frequency from 100–200 Hz to 200–250 Hz. Many, if not all, of the pipers are nest-site scouts. The scouts pipe when it is time to stimulate the non-scouts to warm themselves to a flight-ready temperature (35°C) in preparation for liftoff. The time-course of worker piping matches that of swarm warming; both start at a low level, about an hour before liftoff, and both build to a climax at liftoff. When they excluded pipers from bees hanging in the cool, outermost layer of a swarm cluster, they found that these bees did not warm up. The form of worker piping that we have studied in swarms differs from the form of worker piping that others have studied in hives. We call the two forms “wings-together piping” (in swarms) and “wings-apart piping” (in hives) (Seeley and Tautz 2001). 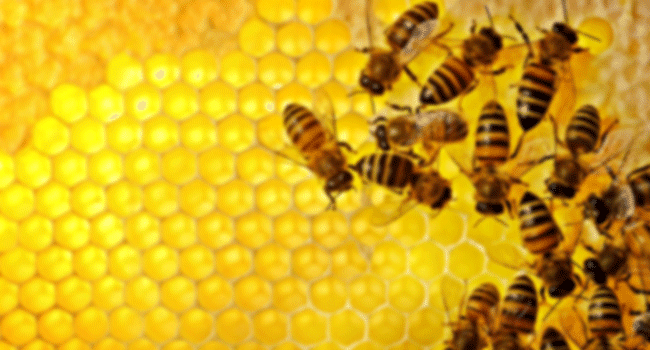 Worker honey bees recovering from CO2 narcotization emitted a distinctive ‘quacking’ sound consisting of a series of short notes, each possessing multiple harmonics and a fundamental frequency around 400 Hz. Quacking was usually accompanied by a distinctive ‘shoving’ behavior. Paired bees ‘quacked’ more frequently than single bees (Schneider and Gary 1984). Of the many signals used by honey bees during the process of swarming, two of them – the stop signal and the worker piping signal – are not easily distinguished for both are mechano-acoustic signals produced by scout bees who press their bodies against other bees while vibrating their wing muscles. To clarify the acoustic differences between these two signals, Schlegel et al. (2012) recorded both signals from the same swarm and at the same time, and compared them in terms of signal duration, fundamental frequency, and frequency modulation. Stop signals and worker piping signals differ in all three variables: duration, 174 ± 64 versus 602 ± 377 ms; fundamental frequency, 407 versus 451 Hz; and frequency modulation, absent versus present. While it remains unclear which differences the bees use to distinguish the two signals, it is clear that they do so for the signals have opposite effects. Stop signals cause inhibition of actively dancing scout bees whereas piping signals cause excitation of quietly resting non-scout bees. Thom et al. (2003) investigated the brief piping signals (“stop signals”) of honey bee workers by exploring the context in which worker piping occurs and the identity and behavior of piping workers. 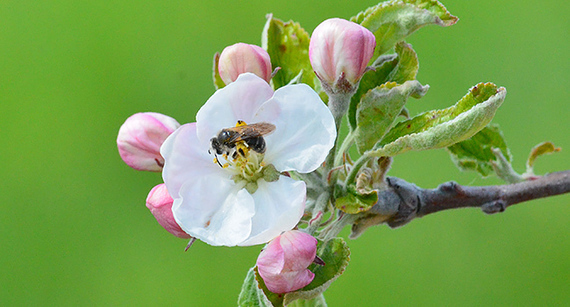 Piping was stimulated reliably by promoting a colony’s nectar foraging activity, demonstrating a causal connection between worker piping and nectar foraging. Piping was stimulated reliably by promoting a colony’s nectar foraging activity, demonstrating a causal connection between worker piping and nectar foraging. Comparison of the behavior of piping versus non-piping nectar foragers revealed many differences., e.g., piping nectar foragers spent more time in the hive, started to dance earlier, spent more time dancing, and spent less time on the dance floor. Most piping signals (approximately 99%) were produced by tremble dancers, yet not all (approximately 48%) tremble dancers piped, suggesting that the short piping signal and the tremble dance have related, but not identical, functions in the nectar foraging communication system.Their observations of the location and behavior of piping tremble dancers suggest that the brief piping signal may (1) retard recruitment to a low-quality food source, and (2) help to enhance the recruitment success of the tremble dance. Wenner (1962) discovered that dancing bees produce sound in waggle dances. Kirchner et al. (1988) found that dance sounds are also made in round dances. The dance sound signals are emitted as airborne sound by dorsoventral vibrations of the wings (Michelsen et al. 1987). Allen, M.D. 1956. The behaviour of honeybees preparing to swarm. Brit. J. Anim. Behav. 4: 14-22. Grooters, H.J. 1987. 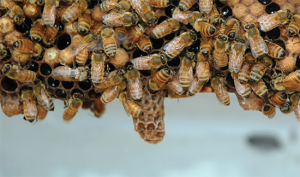 Influences of queen piping and worker behaviour on the timing of emergence of honey bee queens. Insect Soc. 34: 181-193. Harano, K. and Y. Obara 2004. 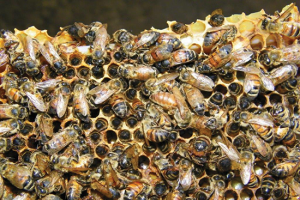 The role of chemical and acoustical stimuli in selective queen cell destruction by virgin queens of the honeybee Apis mellifera (Hymenoptera: Apidae). Appl. Entomol. Zool. 39: 611-616. Kirchner, W.H., M. Lindauer and A. Michelsen 1988. Honeybee dance communication: acoustical indication of direction in round dances. Naturwissenschaften 75: 629-630. Michelsen, A., W.H. Kirchner, B.B. Andersen and M. Lindauer 1986. The tooting and quacking vibration signals of honeybee queens: a quantitative analysis. J. Comp. Physiol. A 158: 605-611. Michelsen, A., W.F. Towne, W.H. Kirchner and P. Kryger 1987. The acoustic near field of a dancing honeybee. J. Comp. Physiol. A. 161: 633-643. Pratt, S.C., S. Kühnholz, T.D. Seeley and A. Weidenmüller 1996. 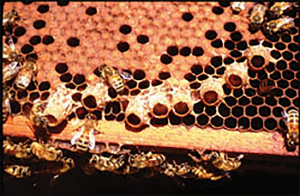 Worker piping associated with foraging in undisturbed queenright colonies of honey bees. Apidologie 27: 13-20. Schlegel, T., P.K. Visscher and T.D. Seeley 2012. Beeping and piping: characterization of two mechano-acoustic signals used by honey bees in swarming. Naturwissenschaften 99: 1067-1071. Schneider, S.S. and N.E. Gary 1984. 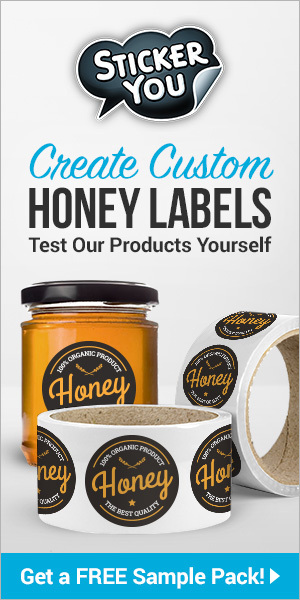 ‘Quacking’: A sound produced by worker honeybees after exposure to carbon dioxide. J. Apic. Res. 23: 25-30. Seeley, T.D. and J. Tautz 2001. Worker piping in honey bee swarms and its role in preparing for liftoff. J. Comp. Physiol. A 187: 667-676. Simpson, J. 1964. The mechanism of honey-bee queen piping. Z. vergl. Physiol. 48: 277-282. Simpson, J. and S.M. Cherry 1969. Queen confinement, queen piping, and swarming in Apis mellifera colonies. Anim. Behav. 17: 271-278. Spangler, H.G. 1971. Effects of recorded queen pipings and of continuous vibration on the emergence of queen honey bees. Ann. Entomol. Soc. Am. 64: 50-51. Thom, C., D.C. Gilley and J. Tautz 2003. Worker piping in honey bees (Apis mellifera): the behavior of piping nectar foragers. Behav. Ecol. Sociobiol. 53: 199-205.